iridescence, reminded me of an Audubon painting. 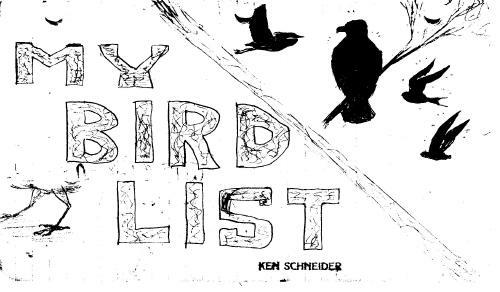 As a Boy Scout, in the winter of 1948, I suddenly decided to keep an orderly list of the birds I saw. With Monkish precision I drew grid lines on 4×7 loose leaf sheets, with headings: “Name of Bird… Date Seen…Where the Bird was Seen… ,” and numbered each entry. I used my date stamp as if it had the power of a wax seal that certified the authenticity of my sightings. Here is the cover; click on it to see the first two pages. The wild places of my New Jersey neighborhood, each with its special name and once so familiar, are nearly all gone now. 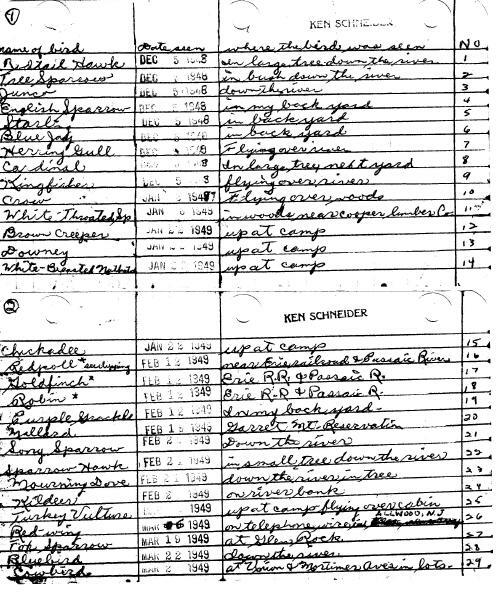 The second page of my ledger brings vividly into memory my Lincoln’s Birthday sighting of a (Common) Redpoll, and references a clipping in the local paper that recognized my accomplishment, proudly supplemented by quotations from Allan Cruickshank’s Birds Around New York City, which states: “This northern finch… is a decidedly irregular winter visitant, usually very rare.” The Redpoll’s expansive grassy plain, where the Erie Railroad bridge used to cross the Passaic River, now gets a weekly manicure, and hosts a football and soccer stadium. Yesterday, a “mudhen,” or Common Gallinule as I first learned to call it (now Common Moorhen), looked out at me through the vegetation. Golly, it is nice to stop and notice how another “drab” and common bird can be so colorful. Yesterday morning I had an hour to spare and on my way home from the auto service shop I stopped at a small wetland next to the Southwest Broward County Regional Library in Pembroke Pines. This spot has a nice boardwalk and sometimes harbors bitterns and Limpkins. I had a goal in mind, and that was to spot one more exotic Purple Swamphen before the last of them was gunned down in the extermination program. I had no luck with the swamphen, and when I saw no Purple Gallinules I worried that maybe the shotgunners had not discriminated between them and their larger purple immigrant relatives. However, all birds were few and far between, not too surprising since it was already nearly noon. I have a soft spot in my heart for this little honeybee visiting the Arrowhead. At our home at 7000 feet elevation in New Mexico, honeybees had trouble making it through the winters. We had a long-standing colony living in the rood of a neighbor’s shed. He ignored them until early one spring, when a bear tore away most of the shingles and roof deck in search of honey. A beekeeper (or more probably, an exterminator) removed the bees and, thereafter, we rarely saw them in our garden.